Mojoy: SOMETHING is coming,... and it is BIG! SOMETHING is coming,... and it is BIG! Ok, let me explain. I filled out a planner on January 1st of this year. 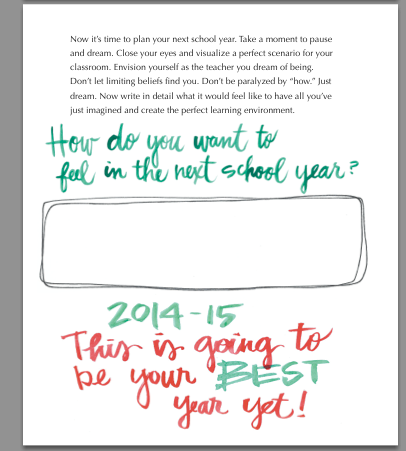 It was a neat little workbook which asked me all kinds of questions about things I intended to get done this year. And because, through all of my personal growth studies, I KNOW that in order to actually get things done, one must be INTENTIONAL, I really appreciated this accountability. However, there were some things that I felt needed to be added to that workbook, and lots of deletions. Sooooo.... being me, I thought, I'll just create my own! And so. I did. I worked on it diligently when we were at the beach. Suzy was a great help! As we developed the pages, she said, "OH MY GOSH. You MUST do one just for teachers!" Because many teachers start looking for their planners in July, this became my first priority. And the Let's Grow! 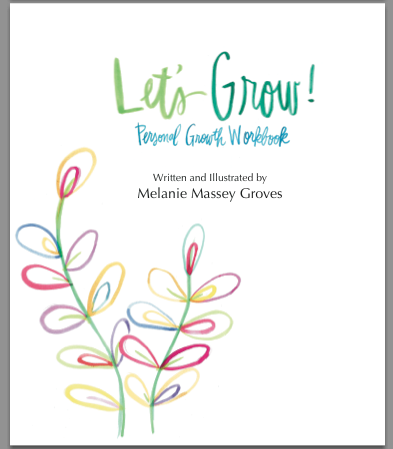 Personal Growth Workbook was born! We had weekly meetings, and right on schedule... we completed the draft Friday and intend to have it to the printer next week! Suzy was extremely helpful with developing the questions for the teacher's workbook. She has been in the school system for many years now, and she has also been participating in the Common Core environment. She felt that having a planner which could be produced as "evidence" at the end of the year for "professional development" was a great idea. There are a few very "intentional" (there it is again!) inclusions which should make teachers and administration very happy to see. I have a place in the front of the book for one to decide on 100 things that she needs to get done in the coming year. That may seem like a lot, but trust me... I did it, and it is no big deal. One can always add to the list as things occur to them. When I went back and looked at my list in June of this year, I COULD NOT BELIEVE how many things I'd accomplished! I mean, like, BIG THINGS. (and now I can also scratch "create my own planner" off the list as well!). I went a step further and divided the 100 things into 4 distinct categories. 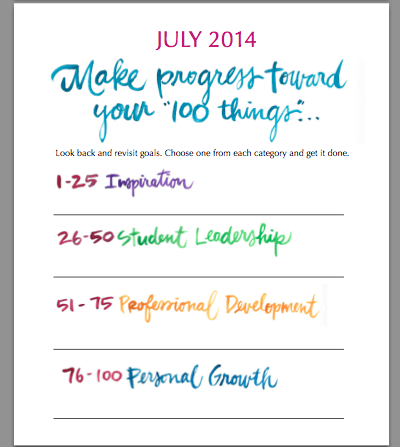 My INTENTION is to develop several of these workbook/planner/calendars! The next one will be more generic, will not have the "teacher flair" and will have more motivational/ inspirational/ "let's get it DONE" feel! It will be ready by October of this year for your 2015 planning calendar. The 100 things will be totally different categories as well. before each new month in the calendar section which hold you accountable to the goals you set at the beginning of the school year. They break the goals down again, and you only need to pick one or two on which to focus that month. By the end of 12 months, you'll be SHOCKED at all you got done!! In the book, I will be including a "shoutout" section! If YOU would like to be potentially featured, comment your answers to the following questions or You can email them to admin@mymojoy.com. I hope to talk to some school districts about providing an inservice on how to use the books, so maybe I'll show up in your neck of the woods! Cool, huh?! Of course, I can't list everyone, but I would like to give a little credit to some of my long time blog followers who happen to be teachers! And just think, when you are asked to give proof of your "PD" (Suzy said ALL teachers know what that is... for the rest of us, it's "Professional development"), you'll have it all nice and concisely in one spot. This one spot will also serve as your daily inspiration, your guide for living very intentionally, and your calendar... all in one little book! WHO IS EXCITED?! I surely am! If you would like to reserve your copy, for now the best option is to send an "I WANT ONE" email to admin@mymojoy.com. I'll have more details and pictures in the very near future. Also, follow my Mojoy Facebook page and you will see an add with a few different pages highlighted on it. The planner is $35 and will be your roadmap for the next 12 months. Hope you like it. I'll be dropping more info on it in the coming week! My word for this year was intentions. And this post makes me feel like you are screaming at me in a good way. I may want one but need to see more first. I've actually already made most of my own planner including my grade book. This is making me rethink! Again, in a good way!! You are always an inspiration. I can't believe you have taken on one more thing lol lol lol. I just want to follow you around for one day to see how you do it! Not a teacher, but just finished up with having kids in school and volunteering a lot! Sounds like a tool that a lot of teachers will love. And of course with feedback nod suggestions you will get to enjoy tweaking it for next time. LOVE this! I was recently looking at potential new planners, but I will now be waiting for yours in October. Oh love your ideas in a planner. Can't wait to get my own! I teach K-6th grade Title 1 Reading so planning is the only way I survive! Thanks for following through with your plan! I'm excited about the planner! I was just on vacay and didn't take time to answer! I love the book! I think the bright colors are wonderful! Can't wait to see the one in October! I am excited about the planner and excited for the opportunity to use it when it becomes available. 4) I am a first year Montessori teacher and don't have any favorites yet, I would love some suggestions! I am not a teacher but work at a University in an Academic setting. I would love to see more to see if it could work for me. If not, I would like the more Generic one in November!